There’s some interesting EarthBound/MOTHER stuff this week, here’s a quick look! This was apparently used to promote the MOTHER3+ soundtrack CD way back when. 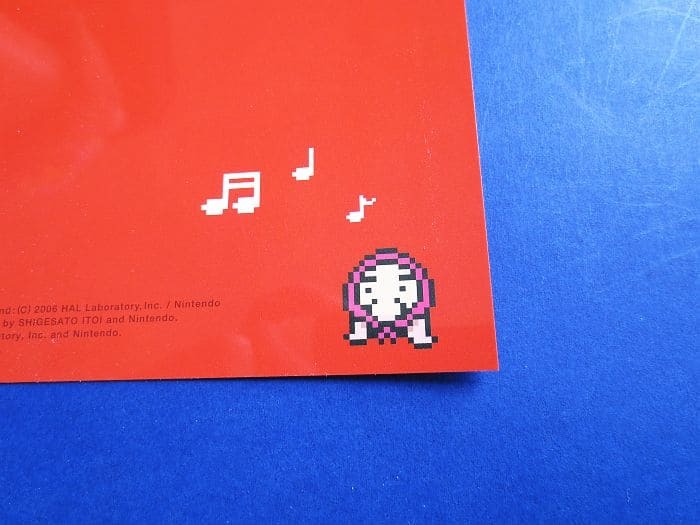 It features a disguised Mr. Saturn in the bottom corner, and the back side has stuff all about the album. MOTHER 1, MOTHER 2, MOTHER 3, and Extra Goodies! 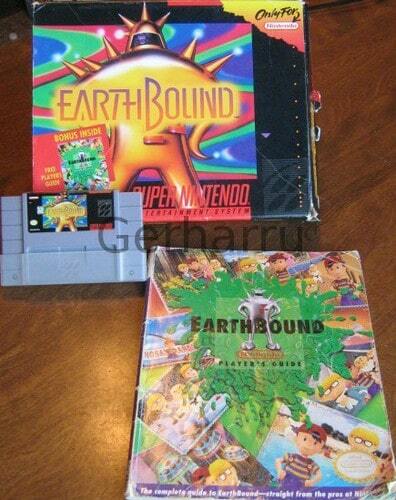 If EarthBound is the only game you have in your collection but you’ve been wanting to pick up the Japanese games too, here’s your chance to get all three games from the MOTHER series! 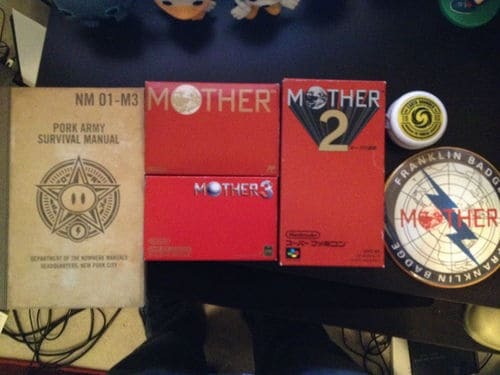 It comes with some extras too, like a MOTHER 3 Handbook and a Fangamer yo-yo! Although there’s nothing really out of the ordinary about this, I’m plugging this for a fellow fan 😛 As of right now, it looks like it’ll be a much better deal than the buy-it-nows for complete sets, so give it a gander if you’re interested! That’s all for now! If you come across anything cool, let me know! Looks like somebody bought the proto cart. Wouldn’t surprise me if someone just took out the chip in the official game and put it into a fake cartridge. I’m going to start making prototypes! Well it has a similar text layout as other SNES protos. I am a 13 year old with very few funds. Where can I get cheap Mother stuff without bidding? Thanks.us If all else fails Ill keep making obese little Mr. Saturn clay figures! Holy cow that Franklin Badge is huuuuge!! Where’d it come from?? I was wondering what the “MB” in the serial number stands for…does anybody know? 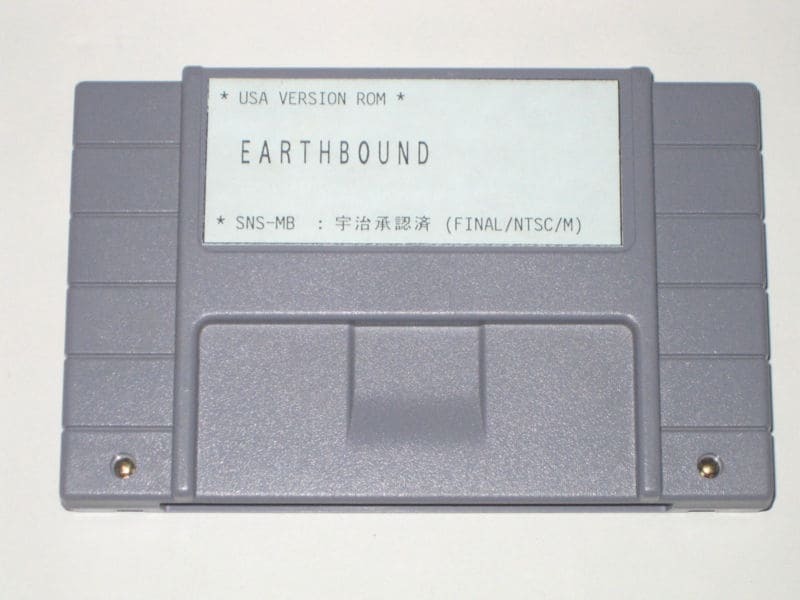 The seller said it says, “SNS-MB” instead of “SNS-MB-USA”…is there a chance it could be a different version of Earthbound than the retail version? O_O So no one has any clue what’s up with that giant Franklin Badge? Anyone know who won the auction? I messaged the seller, hoping he responds to tell me where that thing came from, but otherwise, if the seller is a regular here, maybe they can give us some more info and pictures of that thing. For reference, the seller of that auction replied to me and told me it was one of the pins from Zazzle. As I thought, he said the quality is not the best because of how large the image has to be blown up to that size.